Druknroll gruppo russo nato a Saratov nel 2006 prima come progetto solista, evolutosi in una band. I Druknroll hanno debuttato con “Brownian Motion” nel 2010, con la label NewRock. Nel 2012, per la label Metal Scrap Records, è uscito il loro secondo album “On the Knife Blade. 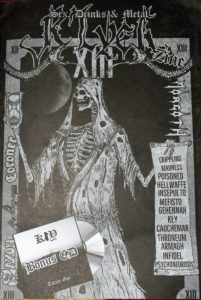 L’anno successivo compaiono nella metal compilation “Planeta Metal presents: Neurasthenia and the Best Russian Metal Bands!” headliner della raccolta, invitati espressamente dai nostrani Neurasthenia. Ancora per Metal Scrap Records, pubblicano nel 2014 “Boiling Point”. Il quarto album, “In The Game” è stato pubblicato nel 2016 ed è proprio di questo disco che mi accingo a parlare. L’album si apre con l’assolo di basso, apprezzatissimo dalla sottoscritta, della prima traccia “The Wolf”, brano che si sviluppa in suoni sinfonici creati dalle tastiere. Cori operistici, chitarre e batteria danno inizio all’intero lavoro. La seconda traccia “Abyss” è un concentrato di adrenalina e speed che intreccia cori epici a thrash. Un altro pezzo degno di nota è sicuramente “Below”, un brano corposo e pesante, molto heavy e con arie operistiche che rendono questa traccia decisamente non solo interessante ma di rilievo, in cui si può apprezzare l’operatività della band. “My Role” è un’altra traccia molto interessante, il basso è presente in maniera costante per l’intera durata del pezzo, una eccellente presenza di chitarre. Un thrash quasi progressive per il brano “The Loop of World Creation” in cui le tastiere entrano nel pezzo per lasciare spazio a chitarre e la furia della voce. La title track “In the Game”, è un brano che continua nella direzione prefissata e con la quale il gruppo fa della propria musica una determinazione, composizione eccellente. “Monomakh” è un’ottima composizione in tessuta da quiete e suoni orchestrali che s’intervallano con schegge irruenti evidenziando l’assolo di chitarra. Tema gotico per la bellissima “In the Depths of No Return”, un death melodico dall’aria seducente dettata dai cori, questo è uno dei brani maggiormente di spicco dell’album. “Tears”, traccia che chiude questo album, si avvale di una voce femminile, un tocco in più per questo lavoro ben riuscito. I Druknroll riescono ad unire più elementi musicali che li fa distinguere dalle altre band. 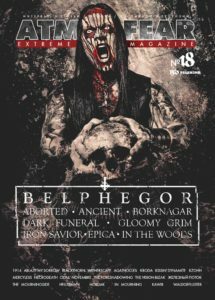 Druknroll are a band from Russia that has been featured before in this zine and plays a mixture of death, thrash, and melodic heavy metal and this is a review of their 2016 album “On The Game” which was released by Metal Scrap Records. A powerful sounding bass guitar lead starts off the album along with some heavy riffs and symphonic synths a few seconds alter and when the music speeds up a great amount of blast beats can be heard and after awhile aggressive screaming vocals and death metla growls make their presence known. When guitar solos and leads are utilized they are done in a very melodic fashion and clean singing is also utilized at times along with the songs also bringing in a great mixture of slow, mid paced and fast parts and clean guitars are also added into certain sections of the recording and when acoustic guitars are utilized they give the songs a more progressive edge and elements of thrash are also mixed into the faster sections of the music and female vocals are added onto the closing track. Druknroll creates another recording that remains true to their mixture of death, thrash, symphonic and melodic heavy metal from previous releases, the production sounds very professional while the lyrics cover dark and real life themes. In my opinion this is another great sounding recording f rom Druknroll and if you are a fan of death, thrash and heavy metal, you should check out this album. RECOMMENDED TRACKS INCLUDE “The Wolf” “My Role” “In The Depths Of No Return” and “Tears”. Nie ukrywaf. te bardziej przypadla mi d o gustu poprzednia ptyta tego zespolu. Byla moie bardziej „mi$kka”, ale przy tym posiadafa interesuj^cq atmosfer$. Tym czasem „In The Game” lo krgiek mocniejszy, a^lszy no i nieco bardziej urozmaicony. Mamy do czynienia z muzyk^, ktdrej wspdlnym mianowmkiem jest metal, a pozostale pierwiastki kr^c^ si$ wokbf rocka progresywnego. Doom Metlu, folk, industrial i Diabel wie czego jeszcze. Poza gitarami i zrywajqcymi si$ czasem do biegu b$bnami. mamy calkiem urozmaicone wokale (pfci obojga) i rdtnego rodzaju sample, czy klawisze. Bez w^tpienia zespolowi udato si$ stworzyd z tej mikstury intrygujqcq atmosfer? i gfdwnie w tym tkwi ich sHa. Zwiericzeniem ptyty jest jakie гдгпщсу si^ od caloSci numer „Tears*, ktdry brzmi jakby wyj^ty z sesji „Icon” PARADISE LOST. Gdyby caly krqiek bylby w podobnym tonie- mielibydmy taki „randkowy” album na zarywanie malolatek hehel Namiary dla chqtnych: Metal Scrap Rec. The album was started by the very dynamic and somewhat crazy thrash-death-metal mixture, in which the main role is played by the multi-vocals – the screams and growls, the dynamic melodic singings and the strong accent of vocals … The songs are densely saturated by the guitar riffs and the strong accent of drums, which makes that music gives you a kick and at the same time is very diverse thematically. 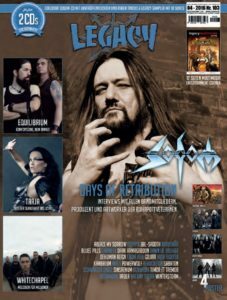 Besides of heavy and fast playing we will hear the different melodies of acoustic guitars, keyboards accents and arpeggios and melodic vocals. And as the lyrics are in Russian then it sounds more interesting. At times the vocals are pompous, like in the communist era. At times some themes I associate with KAT & ROMAN KOSTRZEWSKI and a bit of Polish QUO VADIS. The feisty style of the singing is reminiscent to the way of singing of Roman Kostrzewski. You can also hear this in the acoustic ballads, which pass into heavier playing. In turn, the distorted bass sometimes gives for songs a dirty sound, and the dynamic keyboards gives a para-symphonic breath or a hit of Electro in Techno style. At times there is more death, other times – more thrash. Overall the music is a very dynamic, melodic and heavy. The album can surprise thanks to these arrangements. It is very well thought out and coherent, I would say it even is progressive. За творчеством саратовской группы DRUKNROLL я слежу давно, начиная со второго альбома. Если я все подсчитал верно, то в этом году группа отмечает свое десятилетие. И отмечает его своим четвертым альбомом. Творчество группы всегда лежало вне стилистических рамок. Для упрощения их называли модерн металлистами, что во многом не соответствует общепринятому понятию о стиле modern metal. Их творчество привлекало своей новизной и непредсказуемостью «открытых» металлхэдов, но и отталкивало любителей ортодоксальных стилей. К четвертому альбому сильно многое не изменилось. Единственное на что стоит обратить внимание, группа научилась преподносить свою музыку в наиболее легком для восприятия виде. Во всем остальном это все тот же DRUKNROLL. Если любили их раньше, то останетесь их фэном и дальше. Тексты не тривиальные, радует проработка и прослушивание вызывает интерес. А вот оформление для релиза можно было проработать также глубоко как музыку или лирику. У одиозного саратовского коллектива в нынешнем году большой юбилей – ровно 10 лет назад этот состав был запущен человеком, который вынес в название проекта свой псевдоним и стал экспериментировать по совмещению самых разных металл-направлений: от пауэра, трэша, дэта, симфо, модерн-металла, прогрессива и вплоть до традиционного хэви-металла и альтернативы. Со временем проект превратился в полноценную группу, которая, окрепнув и набравшись опыта, всё также продолжает смешивать, взбалтывать и предлагать слушателям свой стилистический коктейль Молотова. “В игре” – уже четвёртый полноформатный альбом коллектива, и его, безусловно, можно назвать самым профессиональным, выверенным и совершенным. Взяв постапокалиптическую смелость модерн-металла, математическую изощрённость прогрессива, бронебойную прямолинейность дэта, трэшевый кач и симфо-металлическую помпезность, Druknroll по сути играют всё тот же хэви металл – всё тот же хэви, но с поправкой на тот простой факт, что на дворе уже давно третье тысячелетие. И их музыка – это действительно металл нового миллениума: агрессивный, жёсткий, свежий и убедительный. Особая тема в творчестве Druknroll – тексты. Они почти по-крупновски цепко и рельефно написаны, имеют смысл и вполне определённый идейный посыл, который временами даже не чужд патриотических аллюзий (“Мономах”), и наконец, они просто очень приятны на слух. Группа великолепна, их новый альбом шедеврален. Что сказать ещё? Быть может только то, что если вы имеете аллергию на авангард в любом его проявлении, а от винегрета у вас начинаются мигрени, то, возможно, принимать этот препарат стоит дозировано. Но принимать стоит. DrukNRoll is a band Russian Heavy Metal band who has been around for ten years now. In that time, they have kept themselves busy, releasing one EP and four full-length albums. The album that I am focusing on today is entitled In The Game and is both the newest record released by the band and the first one with an English title (as opposed to the previous three, including the EP, which all had titles in their native Russian). It is worth mentioning, however, that every last one of the ten tracks present on In The Game have both a Russian and an English title: And from what I can gleam, the songs are performed in a mixture of these two languages as well. An amusing little fact, but not something that neither saved nor ruined the album for me. Musically DrukNRoll have managed to create a very rare sound for themselves by taking a Heavy Metal frame and adding piles and piles of melodic elements to it (which is mostly noticeable through the use of keyboards and sound effects). This, as some of you might now, is something that I generally like and look for in bands; A unique sound shows character and talent, in my opinion at least. However, when a band strays too far from the genre that they started out playing (Heavy Metal in this case), I generally end up being discouraged due to it not resembling what I would usually expect. This is not, per se, the case with In The Game; It is special, definitely, and at the far end of what I would classify as Heavy Metal (but still within the parameters). All in all that made it difficult for me to relate to it. Luckily for me, the last track on the album (”Tears”) made it a lot easier for me: The addition of a bit more emotion and a female vocal track on top of the very powerful, very angry frame that permeaded the rest of the album tipped it into my ‘I like it’ bowl. Sadly, that track is not present on YouTube, so I will instead link to the next best thing: The track ”The Wolf”, which can be found as the very first track on the album. Im konsequenten Rhythmus von zwei Jahren beweist das Quartett aus Saratov, dass sie hoch hinauswollen und gern als die neuen Soilwork bekannt wären – DRUKNROLL mischen jedoch die Stile von zahlreichen Bands, und so schreddert hier auch immer wieder eine Children Of Bodom-Anlehnung durch die schnellen, keyboardlastigen Songs, die sich allerdings durch ein Element von der Konkurrenz abheben: Die Russen singen in ihrer Muttersprache und klingen auch von der Melodieführung einfach anders als das Übliche, was unsere skandinavisch-verwöhnten Ohren gewöhnt sind. Leicht zugänglich sind sie damit nicht, und speziell die Keyboards haben einen irritierend fiesen Hauch an sich, der von der unbehaglich düsteren Atmosphäre ein Stück an Gojira erinnert, doch immerhin muss man den Russen lassen, dass sie etwas erschaffen haben, das es nicht zwei Mal gibt. Rock’n’Roll sucht man bei DRUKNROLL übrigens vergeblich, aber irgendwo grooven die Herren sich etwas zwischen Melodic Death, progressiven Klängen und gelegentlich sogar Folk-Elementen zusammen. Dies ist der erste der vier bisher veröffentlichten Longplayer, die mit englischsprachigen Songtitel versuchen, dem internationalen Publikum den Zugang zu erleichtern, doch wer sich auf DRUKNROLL einlässt, muss ein offenes Ohr für neue Welten mitbringen, denn 08/15-Sound liefern die Russen definitiv nicht. The Russian Druknroll is a band that knows how to persevere. Their fourth album ‘In The Game’ is again an album sung entirely in their native tongue and that will certainly not constitute a large fan base outside their own country. The music is just like on the previous albums a mixture of various styles and bands. A kind of melodic death metal with a lot of keyboards (and even piano) and alternately raw and clean vocals. They play very enthusiastic, but there is still little balance in the music. There is little consistency in the songs and in the weirdest places they include a kind of Russian men’s choir mixed through the music. This album will surely soon be forgotten I’m afraid. У одиозного саратовского коллектива Druknroll в нынешнем году большой юбилей – ровно 10 лет назад этот состав был запущен человеком, который вынес в название проекта свой псевдоним и стал экспериментировать по совмещению самых разных метал-направлений: от пауэра, трэша, дэта, симфо-металла, модерн-металла, прогрессива и вплоть до традиционного хэви-металла и альтернативы. Со временем проект превратился в полноценную группу, которая, окрепнув и набравшись опыта, всё также продолжает смешивать, взбалтывать и предлагать слушателям свой стилистический коктейль молотова. “В игре” – уже четвёртый полноформатный альбом коллектива, и его, безусловно, можно назвать самым профессиональным, выверенным и совершенным, что, конечно, с другой стороны, не могло не привести к некоторому сглаживанию углов. Druknroll сейчас уже далеко не так революционны и шероховато-претенциозны как в начале своего пути, но загрузив в свой CD-приёмник их новый релиз, вы будете уже просто не в состоянии оспорить тот факт, что мы имеем дело с творчеством настоящих профессионалов. И если мы говорим о Druknroll образца 2016 года, то это факт номер один. Взяв постапокалиптическую смелость модерн-металла, математическую изощрённость прогрессива, бронебойную прямолинейность дэта, трэшевый кач и симфо-металлическую помпезность, Druknroll по сути играют всё тот же хэви метал – всё тот же хэви, но с поправкой на такой простой факт, что на дворе уже давно стоит третье тысячелетие. И их музыка – это действительно метал нового миллениума: агрессивный, жёсткий, свежий и убедительный. И это факт номер два. Как и полагается хорошей метал-пластинке, “В игре” содержит целый набор великолепных эпичных треков (“За чертой”, “В игре”), агрессивные прямолинейные вещицы, не лишённые при этом своеобразной мелодичности (“Бездна”, “Петля мироздания”, “В параллельных плоскостях”), превосходную балладу “Моя роль” и околобалладную среднетемповую “Мономах”. Но эпик альбома — сокрушительный, почти авангардный трек “Слёзы”, словно соединивший воедино Celtic Frost “Into The Pandemonium” и Paradise Lost “Icon”, не забыв про чарующий эпизодический женский вокал и соответствующие околодумовые прелести. Особая тема в творчестве Druknroll – тексты. Они почти по-крупновски цепко и рельефно написаны, имеют смысл и вполне определённый идейный посыл, который временами даже не чужд патриотических аллюзий (“Мономах”) и просто исконно-русской патетики, и наконец, они просто очень приятны на слух. И меня вновь не перестаёт удивлять тот факт (и это факт номер три), что Druknroll практически не известен за пределами родного Саратова и особо не стремится к большему, хотя имеет целую пачку самых положительных ревью от именитых забугорных изданий и критиков. Быть может, всё изменится сейчас, когда Metal Scrap наконец-таки реализовал CD, отмеченный цифрами 2016 и озаглавленный “В Игре”? Помню, как, с каким трепетом и нетерпеливым предвкушением ваш покорный слуга ждал в конце 1997 года выхода нового альбома легендарных британских громовержцев Judas Priest , и вот долгожданный момент настал, и в одной из радиопередач “Рок-Интенсива” Всеволод Баронин выдал в эфир “Jugulator” от начала и до конца. Это было просто нереально круто, и на тот момент более чем революционно, но я принял новую пластинку метров, даже не моргнув глазом. Не знаю, почему, но для меня не было сомнений в том, что это всё тот же старый-добрый хэви-метал, но слегка осовремененный и припудренный актуальной железной стружкой, а отход от канонов и идеалов если и был, то исключительно за пивом. Точно такие же впечатления у меня возникают и от творчества саратовских экспериментаторов. Экстремальный хэви-метал во всей своей красе, мощи и великолепии. И этого великолепия здесь столько, что я начинаю думать, что не так уж и напрасно в начале 90-х журнал Тттррах! объявил о том, что вот-вот грядёт эпоха нового метала, который будет объединять в себе всё лучшее от всех известных жанров – эпоха так называемого “тотального металла”, как они его тогда назвали, приводя в качестве примера предтеч такого жанра всё тех же именитых швейцарцев Celtic Frost. Что сказать, сейчас Druknroll вполне можно назвать таким total metal, при этом ничуть не погрешив против истины. Группа великолепна, их новый альбом шедеврален. Что сказать ещё? Быть может только то, что если вы имеете аллергию на авангард в любом его проявлении, а от винегрета у вас начинаются мигрени, то, возможно, принимать этот препарат стоит дозировано. И это факт номер четыре. 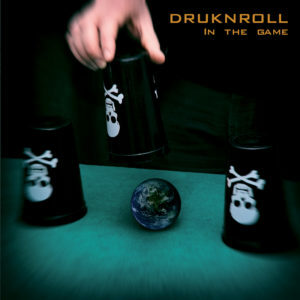 “In The Game” is the fourth full-length album from Russia’s one and only Druknroll. It follows the 2015 EP, “Петля мироздания” (“The Loop Of World Creation”) and this 44 minute release features 10 distinct tracks from group-founder Andrey “Druknroll” (guitar, bass, and keys) and company. Starting off strong thanks to forceful opener “The Wolf” (official video ), “In The Game” snakes it’s way through a hazard-filled landscape where everything from heavy metal-flavored harsh thrash to melodic death metal just lays there waiting for the perfect chance to spring out and strike you dead! Having previously covered this Saratov-based band back in late April of 2014 (link) I feel somewhat comfortable in saying that style-wise not much has changed for this colorful lot. Of course by that I mean there really is no one true style for this modern metal that has been in existence since 2006. Like it’s unique moniker, Druknroll does things however it sees fit and that isn’t necessarily a track by track affair, but during the course of a single song! To be fair it doesn’t always work as things can and sometimes do become chaotic. That’s the danger of trying to put too many ideas into a single song. It’s a small danger, but a danger nonetheless. But, what’s life without a little danger now and then? It’s boring. Thankfully that’s not a problem with “In The Game”. Above all else it’s never boring! Chaotic? Perhaps. But boring? No way! At it’s core an album like “In The Game” is geared towards those who like their modern metal to be interesting and maybe even a little bit genre-jumbled. In that essence it works and it makes me wonder what more this band is capable of now that they are more familiar with the English language? Druknroll est un groupe de modern metal russe originaire de Saratov et actif depuis 2006. Druknroll a publié le single Металлическая ночь en 2006 et puis il est reste en attente jusqu’à la sortie de son premier album Броуновское движение (album qui reprenait le single). Ensuite pour son deuxième album На лезвии ножа (2012) Drukroll se lie au label Metal Scrap Records. Il s’ensuit une collaboration qui continue avec l’album Точка кипения (2014), l’Ep Петля мироздания (2015) et l’album dont on parle aujourd’hui In The Game / В Игре. On peut constater l’envie de viser un public plus large grâce à un titre en russe et anglais et aussi à une tracklist avec les titres en russe et leur traduction en anglais. Mais le tout s’arrête ici. Le groupe chante en russe et les lyrics (présentes dans le livret sont aussi en russe). Druknroll avec son dernier album In the Game / В Игре nous présente un album de 10 titres très réussi et intéressant puisque les titres se suivent et se différencient. The Wolf ouvre les hostilités avec un riff moderne qui enchaine sur du thrash metal pur jus. Le refrain se veut accrocheur, costaud, direct. Il y a un léger soupçon d’électronique qui est le bienvenu. Pour certain aspect on pourrait penser à Fear Factory. Abyss est encore un titre thrash metal avec des mélodies élaborées et très modernes. Below interpelle pour l’utilisation d’une voix grunt plus profonde en alternance avec une voix plus claire. Il y a aussi un joli break central. My Role se présente comme une balade qui ne casse pas la patte à un canard mais permet de reprendre son souffle juste avant The Loop of World Creation. 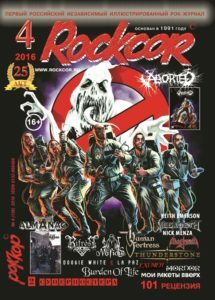 Et là on se dit qu’il y a depuis le début de l’album comme un écho de Children Of Bodom, Soilwork, Mercenary, In Flames, Nevermore et Manimal. In the Game est un très bon titre avec à la clé un très bon travail sur le refrain et les chœurs. In the Depths of No Return se caractérise par sa mélodie de heavy metal / death mélodique à la In Flames. Druknroll avec In the Game / В Игре signe un très bon album de metal méldoque / modern metal. Les 10 titres s’écoutent avec plaisir et sont très bien élaborés. La base est thrash / MDM mais dans tous les titres il y a une recherche qui va loin, que ce soit dans les chœurs, les refrains, les soli de très bonne facture ou les changements de tempi. Druknroll sait se faire original sur la durée et ceci n’est pas anodin. Si Druknroll arrivait à faire plus d’effort sur la pochette et peut-être à se mettre à l’anglais, ceci lui permettrai de s’exporter au-delà de la Russie. El sello ucraniano Metal Scrap Records nos presenta el nuevo trabajo de la banda de Metal moderno DRUKNROLL, su título en inglés es “In The Game” y supone ya el cuarto lanzamiento de estos rusos, aparte de su single debut y el EP digital que precede al álbum y que vio la luz el pasado año 2015 bajo el título de “The Loop Of World Creation”. Y es que estos tipos, que comenzaron como el proyecto en solitario de su líder, llevan a sus espaldas una trayectoria de alrededor de una década, tiempo suficiente como para desarrollar su propia personalidad y dejar constancia tanto en sus discos como en recopilatorios y vídeos musicales. Todo esto para dar vida a un estilo muy personal construido a base de influencias de lo más diversas y aires modernos que consiguen evitar la tentación de las modas. Ya tuve ocasión de escuchar el anterior disco de DRUKNROLL, titulado en inglés “Boiling Point”, por lo que tenía una buena predisposición ante este nuevo larga duración. Además recientemente sacaron un EP digital de dos temas más una versión de IN FLAMES que tomaba bien el pulso al estado de forma de los rusos, por eso ya imaginaba que “In The Game” iba a ser un trabajo de lo más interesante. Y efectivamente así es, de hecho el grupo sigue con su particular combinación de sonidos que hacen difícil etiquetar su música, su sello lo llama Progressive Melodic Modern Thrash/Death Metal y no va desencaminado. Además sorprendentemente el grupo logra nutrirse de todas estas influencias sin que el resultado sea caótico y, como decía antes, sin necesidad de caer en el típico Melodeath moderno. Por lo tanto lo que DRUKNROLL ofrece es un puñado de temas con una potente personalidad construida a base de fragmentos, como un Frankenstein de Metal. Ismét játékba lendültek az oroszok! Két évvel az igen jól sikerült Boiling Point után megérkezett a folytatás, azaz a Druknroll 4. albuma, In the Game címmel. E rövid tényközlést követően kb. ugyanazokat le tudnám írni, mint az előző lemez esetében. Megmaradtak az anyanyelv használatánál, viszont a záró dal ismét angol szöveget kapott. Az egyszerűség kedvéért ezúttal is az angol címeket tüntetem fel. A felállásban történt némi változás, megfogyatkozott a csapat, 2013-ban távozott az ütősük, azóta programozott dobbal operálnak, amit a szólógitárosuk kezel. Szóval jelenleg trióban nyomul a banda, de ezt leszámítva minden nagyjából ugyanúgy megy tovább. A stílusukat sem reformálták meg, maradt a melodic death Soilwork, Scar Symmetry által képviselt hajtása. Ergo nem vegytiszta MDM ez, hanem egy váltott vokállal előadott korszerű fémötvözet. Ha csak dallamos éneket alkalmaznának, akkor modern heavy metalnak titulálhatnánk őket. Az elég gyakran felbukkanó hörgés, morgás, acsarkodás miatt viszont kap egy kis extrém ízt a produkció. Tehát úgy tűnik alapvetően a hazai piacot célozzák meg a srácok kiadványaikkal. A korong játékideje optimális, 10 szám 44 percben. A The Wolf ideális kezdőnóta, lendületes darab, melyben az extrém vokál dominál. A gépdob sem zavaró, egyrészt nem érezni művibbnek a stílusban elterjedt, akusztikus dobon feljátszott, aztán agyontriggerelt soundnál, másrészt a szintetizátor gyakori jelenléte ugyancsak ráerősít a mechanikus hangzásra. Az Abyss még a farkastámadásnál is fogósabb tétel, melyben az akusztikus gitár hangja is felcsendül, igaz még csak statiszta szerepkörben. Nyilván az orosz nyelv tehet róla, de több szerzemény kórusai, refrénjei kapcsán érzek egy bizonyos “mozgalmi dal” fílinget. Szinte magam elé vizionálok sok-sok kisdobos és úttörő pajtást, akik szent meggyőződéssel éneklik ezeket a “harcba hívó” sorokat. Talán a Below refrénje a “leghimnikusabb”, legmagasztosabb. A My Role akusztikus gitárra épül és egy kis műszimfós fűszerezést is kapott. A dal középrésze emlékezetes, egy frankó akusztikus témát egy röpke basszus, majd egy hosszabb gitárszóló követ. Extrém ének csak a végén hallható, 95%-ban tiszta/dallamos vokállal él benne pacsirtánk. A The Loop of World Creation szintén pofás darab, a mennydörgő basszus kiállásai igazán kedvemre valók! Sőt, az a röpke elektrós őrület is el lett találva. A címadó kórusa ismét a jól megszokott, heroikus vonalat képviseli. Már az előző lemezüknél is érezni lehetett egyfajta teátrális hangvételt, ami nagyrészt a szintetizátortémáknak volt köszönhető. Ez a friss CD esetében még erőteljesebb. A lemezt záró Tears az egyetlen angol nyelvű szerzemény, melyben egy ismeretlen vendégénekesnő is besegít. Érdekes módon engem a Paradise Lost dolgaira emlékeztet leginkább ez a nóta. Még a vokalista orgánuma, stílusa is Nick Holmes-t idézi. Sconosciuti al sottoscritto, questi Druknroll al loro quarto full length sono stati una piacevole sorpresa. D’altronde uno degli aspetti positivi della nostra musica è proprio quella di scoprire nuovi gruppi nel dedalo di generi e sottogeneri del Metal, e la band russa e’ proprio una di quelle la cui classificazione è difficile. Batteria velocissima, stop and go, inserti acustici e talvolta sinfonici, ampio uso di tastiere su un riffama feroce, vocals quasi growl e filtrate (peccato che cantino in russo, non si capisce nulla ! ), un gusto fortissimo per la melodia stemperata da un muro di suono imponente sorretto dal grande lavoro delle chitarre che alternano riff metal con outro puliti, ed una produzione potente e chiara. Il disco necessita di vari ascolti per essere pienamente apprezzato ma li vale tutti, i pezzi scorrono veloci e per quanto mi riguarda sono tutti di buon livello. Segnalarne alcuni vorrebbe dire sottovalutarne altri, per cui il consiglio che vi do, vista la bontà dell’intero lavoro, è quello di ascoltare questo “In The Game” tutto d’un fiato e poi meditare sul perché gruppi come i Druknroll sono linfa vitale per la nostra musica. “Progressive Melodic Modern Thrash/Death Metal”. E’ questa la definizione della musica dei Druknroll che si trova tra le fitte note di accompagnamento fornite dalla loro casa discografica. Il gruppo russo, nato a Saratov nel 2006 come progetto solista, si è poi evoluto in band vera e propria con l’aiuto di musicisti provenienti dagli Kniaz’ T’my ed ha esordito nel 2010 con Brownian Motion. Dopo il bis del 2012 costituito da On the Knife Blade -in mezzo la partecipazione ad alcune compilation, anche in collaborazione con i Neurasthenia- e Boiling Point del 2014, i nostri si ripresentano adesso con In The Game, disco concepito per attestarsi con maggior peso sul mercato occidentale. Al di là dell’ampollosità con la quale la casa discografica definisce la musica composta e suonata dai Druknroll, è effettivamente vero che le influenze che determinano il risultato finale siano molteplici. La base è sicuramente heavy-thrash, ma i passaggi death sono numerosi, così come quelli ascrivibili ad un sostrato progressive e persino industrial, i quali vengono bilanciati da numerosi spunti velati addirittura da una certa nostalgia, con un uso abbastanza sapiente dei samples e delle orchestrazioni. Da non sottacere la buona presenza di un basso molto distorto, nonostante si tratti di un disco concepito per avere un impatto complessivo, più che per mettere in evidenza questo o quell’elemento. Quello che però maggiormente caratterizza una proposta per forza di cosa molto ibrida e quindi potenzialmente insapore, è comunque il suo essere profondamente russa, sia nel senso del feeling che in quello classico-musicale. Ciò si evince non solo dall’uso della lingua madre nei testi (a titolo di cronaca: la seconda lingua più usata in rete) che comunica coraggio, nostalgia, dolore e senso di libertà, ma anche dall’inserimento di cori che rimandano alla tradizione della Grande Madre (Below) e trasmettono le stesse sensazioni in modo “tonale”. Con ciò costruendo un legame chiaramente molto profondo con la propria terra, pur all’interno di una realizzazione mirata in via principale al mercato esterno. Nonostante si tratti di un lavoro nel complesso abbastanza deciso e costruito con quei suoni plasticosi che ben si adattano ad un disco così concepito, in realtà In The Game tocca un po’ tutte le corde possibili, comprese quelle di più facile assimilazione. L’iniziale The Wolf è un perfetto esempio di “cerchiobottismo” tipico del modern-metal, dato che fonde una base cazzuta di stile heavy-thrash-death, con l’uso dell’elettronica ed un gusto molto orientale per i cori, proseguendo sulla stessa falsariga con Abyss. Poi, dopo la già citata Below, My Role inserisce una nota malinconicamente orientale e molto ruffiana, da singolo, per poi piazzare un pezzo come The Loop of World Creation. Questo, inserendo synth, piano, effetti, campane, voce clean e growl, risulta un perfetto esempio di “modernità” che può essere sia avvincente che repulsiva, in base a quanto siete propensi ad assecondare benevolmente l’evoluzione del metal. La title-track prosegue su questa scia, ma ancora con l’inserimento di quei cori russi che il buon Battiato non sopportava, ma che sono la storia russa (Cit. di Maksim Gor’kij). Di seguito, Monomakh riporta a quanto provato con l’ascolto di My Role, ma aggiungendo un’alternanza di passaggi romantici, death e metal che rendono il pezzo più personale, per quanto non particolarmente esaltante. Ancora la tipica malinconia corale russa a fare da trave portante per In The Depths of No Return, ed elettronica più in evidenza con In Parallel Planes, con il thrash/death che torna a farla da padrone, pur nella forma “terzo millennio”. Giochi che si chiudono con Tears, pezzo sospeso con voce femminile a far da controcanto a quella cavernosa del singer Horror, che poco aggiunge all’economia dell’album. Il maggior pregio di In The Game, ossia quello di contenere e fondere almeno quattro o cinque stili diversi in un’unica proposta, è contemporaneamente anche il suo stesso limite. Fermo restando che si tratta di una scelta precisa, che l’uso del russo non ne sminuisce l’effetto (anzi, conferisce carattere al CD) e che i suoni e gli arrangiamenti ottenuti dal mastermind Druknroll sono perfettamente adatti allo scopo, l’album si posiziona comunque naturalmente a metà del guado. Potenzialmente interessantissimo per chi è più propenso ad ascoltare ciò che è venuto fuori dal 2000 in poi, In The Game ed i Druknroll possono invece risultare indigesti a chi non apprezza le contaminazioni del sacro metallo pesante. Ascoltando il lavoro in maniera asettica, però, se ne evincono alcuni pregi e, anche se dal punto di vista della composizione pura non si rilevano spunti di particolare levatura, questo presenta lo stesso delle qualità. Per la maggior parte racchiuse nel suo essere fieramente made in Russia, è vero, ma fruibili agevolmente da chiunque. Non certo un disco epocale, dunque, frenato anche dal suo non avere una direzione musicale precisa (lo ripeto: per scelta), ma un prodotto comunque godibile edito da un gruppo in grado di dare certamente di più. E’ proprio a questo che i Druknroll devono mirare, magari diventando musicalmente ancor più russi di adesso. Denn “In The Game” ist ein ziemliches Durcheinander aus bombastischen Klängen und ziemlich ziellosen Arrangements. Die Russen bemühen sich um Hooklines und einprägsame Melodien, während sie ihre Stakkatos als Kontrast platzieren, doch effektiv kommt bei dieser Vermengung nicht sonderlich viel herum. Das Material kämpft um eine klare Linie, will verspielt und gleichzeitig eingängig sein, kommt aber in keinem der zehn neuen Songs auf den Punkt, was sich bereits in der ersten Hälfte andeutet, in der zweiten dann aber auch immer drastischer bestätigen soll. ‘The Loop Of World Creation’ und der Titelsong beschreiben das Problem im Kern des Albums am deutlichsten. Die musikalische Vielfalt läuft völlig aus dem Ruder, die vielen Melo-Fragmente kommen nicht so recht zum Zuge und auch die Gesangsleistung ist in den Clean-Parts nicht wirklich mitreißend. Irgendwie verliert “In The Game” zwar nicht die Spannung, weil immer neue Elemente dazukommen, aber kein einziger Song bringt dieses Gefühl vollkommener kompositorischer Souveränität, weil die Strukturen viel zu hektisch erstellt wurden. Man will die neue Scheibe von DRUKNROLL nicht durchweg verurteilen, weil einige interessante Ansätze vorhanden sind. Aber spätestens in dem Moment, in dem man die unvermeidlichen Vergleiche antritt, weiß man, dass der vierte Longplayer der russischen Combo noch deutlichen Ausbesserungsbedarf aufweist. Album rozpoczęła bardzo dynamiczna i nieco zakręcona thrash-death-metalowa łupanka, w której główną rolę odgrywają wielobarwne wokalizy – wrzaski, growlnigi, dynamiczne melodyjne śpiewy i mocne akcentujące chórki… Utwory są gęsto nasycone gitarowymi riffami i mocno akcentującą perkusją, co sprawia, że muzyka daje niezłego kopa i równocześnie jest bardzo urozmaicona tematycznie. Poza ciężkim i szybkim graniem usłyszymy tutaj różne melodie akustycznych gitar, klawiszowe akcenty i pasaże oraz melodyjne chórki. A jako, że teksty są w języku rosyjskim tym bardziej brzmi to ciekawie. Chwilami chórki są patetyczne, niczym z epoki komunizmu. Chwilami pewne tematy kojarzą mi się z KAT & ROMAN KOSTRZEWSKI oraz nieco mnie z polskim QUO VADIS. Występujący chwilami zadziorny wokal przypomina sposób śpiewania Romana Kostrzewskiego. Słychać to także w akustycznych balladach, które przechodzą w ciężkie granie. Z kolei zfuzowany bas czasami nadaje utworom jakby brudnego brzmienia, a dynamiczne partie klawiszy para-symfonicznego tchnienia lub uderzenia Electro albo w stylu Techno. Chwilami jest bardziej death’owo, innym razem bardziej thrash’owo. Ogólnie jest bardzo dynamicznie, melodyjnie i ciężko. Album potrafi zaskoczyć swoimi aranżacjami. Jest bardzo przemyślany i spójny, wręcz rzekłbym progresywny. È la terza volta che mi trovo a recensire un disco dei russi Druknroll e per la terza volta sono combattuto. Nelle due occasioni precedenti non ero stato convinto né da “On The Knife Blade” né dal suo successore “Boiling Point”, in quanto l’ampio calderone di influenze — dal death melodico moderno al progressive metal, passando per situazioni heavy e thrash, il tutto condito da una ricerca di orecchiabilità in alcuni casi anche evitabile — usato per dar vita ai pezzi risultava essere talvolta incoerente e caotico, nonché penalizzato dalla prestazione altalenante del cantante Alexander “Horror” Tolgaev. Con l’uscita del nuovo “In The Game” qualcosa sarà cambiato? La risposta è Nì. A favore del gruppo c’è da dire che la voglia di mettersi in gioco non è mai mancata: l’inserimento dei vari cori maschili all’interno di “Below”, la stranamente malinconica “My Role”, l’imprevista e non brutta ma un tantino forzata estremizzazione di “In Parallel Planes” (dotata di un ritornello che stride, in quanto forse sin troppo dolciastro nei toni) o la goticheggiante “Tears” ne sono l’ennesima chiara dimostrazione. A dirla tutta sembra sia pure migliorata l’amalgama fra le varie correnti stilistiche sfruttate, come viene mostrato dal singolo “The Wolf”, per cui è stato realizzato anche un videoclip. Inoltre nel complesso l’album pare scorrere con una maggiore naturalezza, presentandosi meno convulso e frammentario, al contempo trascinandosi purtroppo dietro alcuni momenti — numericamente in diminuzione rispetto alle opere passate — che sanno di incompiuto o eccedono nel complicarsi la vita, facendo perdere mordente alla musica. Il lavoro ci offre l’ennesima riprova della bravura del chitarrista solista Alex Knip, della mente Druknroll in fase di rifinitura elettronica e tastieristica (ascoltate “The Loop Of World Creation” e la successiva “In The Game”) e la conferma dei passi avanti compiuti da Tolgaev, vocalmente più incisivo, soprattutto nei frangenti spinti e tendenti al growl che erano il suo il tallone d’Achille (piccola nota: non fatevi ingannare dai nomi affibbiati ai pezzi, poiché l’interpretazione del cantante è nuovamente affidata perlopiù alla lingua russa). Si può quindi dire che a conti fatti stavolta le note positive battono, seppur non di tantissimo, quelle negative. I Druknroll non hanno ancora centrato appieno l’obbiettivo, una crescita c’è effettivamente stata e non sono più considerabili una creatura oltrepassabile a priori. Sembra che abbiano imboccato la strada corretta per far sì che la troppa carne al fuoco inserita nei loro album venga cotta a puntino, ma se ciò accadrà o meno lo sapremo solo in futuro. Se amate il metal moderno e ricco di melodia, potreste decidere di accordare alla band un po’ di tempo e attenzione in più grazie a “In The Game”.